Following a record Q4 of advertising activity, the UK enjoyed a seventh consecutive year of market growth, as adspend grew 3.7% to reach £21.4bn. 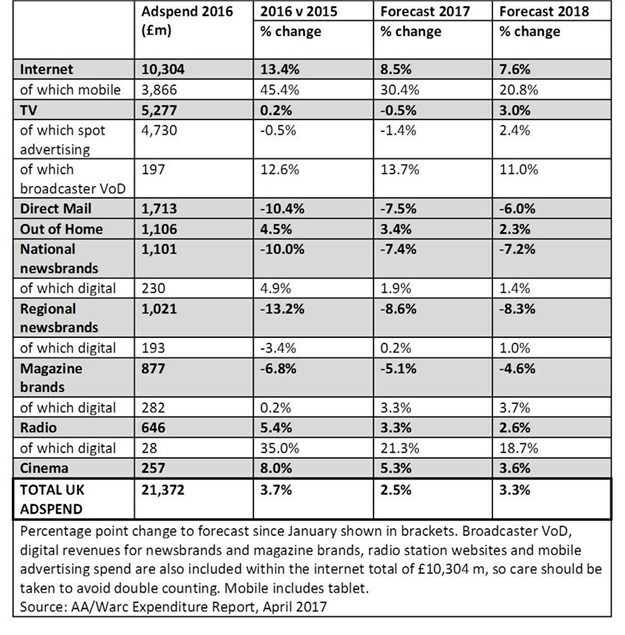 The Advertising Association/Warc Expenditure Report, a measure of advertising activity in the UK, has just published the full year figures for 2016. Growth in UK adspend held steady in Q3 after the June referendum, before reaching £5.8bn in Q4 2016, a rise of 3.9% year-on-year and the highest grossing quarter on record. In real terms, after accounting for inflation, UK adspend topped its pre-recession peak for the first time during both the final quarter and for 2016 as a whole. Forecasts for the next two years indicate continued growth of 2.5% in 2017 and 3.3% in 2018. Digital formats continued to drive growth in 2016, with internet adspend up by 13.4% to £10.3bn, with mobile accounting for 99% of that growth. Mobile spend reached £3.9bn, with 86% of the current value of the mobile advertising market generated in just the past five years. Digital accounted for 38% of the £1.1bn out of home advertising market in 2016, double the share digital recorded in 2012, while revenues from online ads were up for national newsbrands (+4.9% to £230 m) for the fifth year running. TV adspend, boosted by 12.6% growth in video-on-demand revenue, recorded a new high of £5.3bn in 2016, with TV's share of overall spend holding steady at 25% over the last decade. Annual growth in adspend was also recorded for cinema (+8% to £257 m) and radio (+5.4% to £646 m) in 2016. The Advertising Association/Warc Expenditure Report is the only source that uses advertising expenditure gathered from across the entire media landscape, rather than relying solely on estimated or modelled data. With total market and individual media data available quarterly from 1982, it is one of the most reliable pictures of the industry and is widely used by advertisers, agencies, media owners and analysts. Internet adspend rose 15.3% during Q4 2016, pushing the full-year total above £10bn for the first time. Mobile accounted for 99% of the new money entering the internet ad market last year. Television adspend dipped 2.1% in the final quarter of 2016, though this was counter-balanced by rises earlier in the year, resulting in 0.2% growth for 2016 as a whole. Total TV spend is expected to dip this year, before the losses are regained in 2018. Radio adspend rose 7.7% to a record-high level during the last three months of 2016, buoyed by the strongest growth in spot revenue since Q4 2014. Other than internet, radio was the only medium to gain share of total adspend in 2016 (+0.1pp vs. 2015). Out of home (OOH) spend grew by 2.0% year-on-year during the final three months of 2016, supported by a 22.7% rise in digital ad expenditure. Full-year adspend rose for the sixth consecutive year in 2016, and further sector growth is forecast this year and next. National Newsbrands' combined ad revenues fell 9.0% during Q4 2016. The 10.0% dip recorded during 2016 as a whole was, however, £25 m softer than the loss recorded in 2015. The rate of decline is expected to ease further over the forecast period. Regional Newsbrands' ad income dropped across print (-16.7%) and digital (-1.1%) formats in the final quarter of 2016, with combined full-year revenues down 13.2%. As with national newsbrands, the rate of decline is forecast to soften over the coming years. Magazine brands recorded losses in income from both print (-9.1%) and digital (-5.7%) ads in Q4, though full-year digital revenues rose 0.2% thanks to growth among publishers of consumer titles. Cinema adspend grew for the third consecutive year in 2016, topping 2015's peak by 8.0% to reach £257 m. The full-year total was boosted by the highest quarterly spend on record during Q4. Direct Mail adspend was down 9.2% in Q4 2016, and full-year spend was 10.4% lower than in 2015. As with other printed formats, the severity of annual dips in ad revenue is expected to ease.